Spring time, plant seeds for trees. See that creation grow and grow. Then around fall, the leaves fall off and the tree looks dead for a while throughout winter, then spring returns and that tree becomes all green again. With an earthly eye it wouldn’t mean much. It’s the cycle of life, but with a spiritual eye, we might be-able to see God’s way of working with his own people. Trees grow throw a period of shining bright for the world. Jesus as Christian’s go through a period of Shining bright for the world. But then fall comes and the leaves fall off and the tree don’t look the same. Spiritual, Christian’s go through periods in life that we don’t shine and it seems that our life is over. Psalms 23 calls the Valley of the Shadow of Death. James 1 calls it a trail. Matthew 8 calls a storm. Jesus’s and his disciples get in the boat and everything good. What is there to worry about? The son of the Most High God is like right there in the boat with them. This Jesus just heals all these people and men you follow him, everything all be great, you’re safe to go. Well, we wish it was that way. As we exam Matthew 8:23-27, we see few point’s that we can use for our daily Walk with God. The storm came on the people who followed Jesus. The Crowd didn’t go in the storm, but the disciples went in the storm. The Storm came without warning. One minute it was sun shine, next minute it was life and death moment. The Disciples calls, maybe even cried their eyes out to Jesus, “Save Us”. 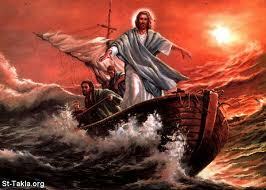 Jesus, not the Disciples, but Jesus calm the Storm. They were going to a new place. They were here, as they travel with Jesus to the new place, then the storm came. They are amazed at what God did in the end. God wants to strengthen our faith, as we travel with Jesus in our Walk with God. These trails, Storms, valleys that we enter to are design for reason. To help us have all our hope, trust and faith in God. God wants us stronger in the faith. That’s why Jesus rebuked them and said, “You of Little Faith, why are you so Afraid.”. Jesus is with us always. It may not seem like it. May seem like he not there. God like to play the quit game at times. That’s why Jesus was sleeping. He wanted his people to cry out for help. He loves it when you cry to him for help. We are going from point A to Point C. In between is point B, the Storm. There is always a scary bridge to cross over, so we are ready for what’s ahead in the plan of God for our life. No matter what has come your way, just remember, God is with you. Pray always to him. Read your bible. Stay connected to God. He will be there to rebuke the storm. You will be amazed at the end result and give him praise. This entry was posted in Study of Matthew and tagged Calm that Storm (Study of Matthew – Part 33), Trail, Valleys by Keith West. Bookmark the permalink.